What if there was a pill that would give you instant access to your greatest potential every time you needed it most? What if that pill was free, had zero side-effects and worked in nearly every domain of life. Especially the ones where so many struggle, from public-speaking and socializing to high-stakes decision-making, sports and nearly any other endeavor where being at your best mattered? And, what if you had an endless supply in your pocket, 24-7, for the rest of your life? According to this week’s guest, founder and elite-performance advisor, Todd Herman, there is. But, it’s not a pill. It’s something you do, a peak performance power-tool he’s taught his clients for decades, from Olympic and pro athletes to CEOs, founders and performers. It’s what he calls the “Alter Ego Effect,” and it’s all about tapping the power of secret-identifies, creating and stepping into them to change not only the way your brain works, but also the way your body performs in an instant. 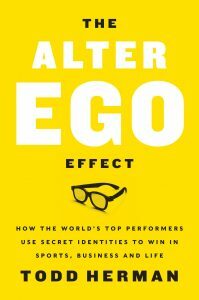 Todd shares the entire Alter Ego methodology, along with the science behind it and a wide-array of case-studies in his new book, The Alter Ego Effect. In this week’s conversation, we explore what shuts so many of us down when we most need to be at our best, how Todd came to understand and then develop the power of alter egos, and how we can tap their power in work, play and life. For a deeper-dive into Todd’s “origin story,” check out our 2016 conversation.